Sergeant PJ Collins was not born in Duneen, but he has been the little town’s resident police officer for more than a decade and a half. Significantly overweight, PJ uses his size as an emotional shield to explain away his loneliness. As policemen go, he is liked by the denizens of the insular Irish village, even if he was no ball of fire. But little happens in Duneen anyway—until one day, when something quite dramatic occurs. Builders putting up a housing estate on the long-deserted Burke farm find the remains of a body buried on the land. Now the sleepy, gossipy town is all atwitter, and PJ is excited to have his first real case. Do the remains belong to Tommy Burke, the young heir to the farm who disappeared about 20 years ago? Rumor has long held that Tommy was seen boarding the bus to Cork the day he went missing, but has he been buried there all along? Turns out the builders have opened up more than a hole in the ground—they have opened old wounds, as well. PJ quickly discovers that just before he disappeared, Tommy was at the apex of an ugly love triangle involving two young women in the village, both of whom still live in Duneen. Brid Riordan was engaged to marry Tommy, but a knockdown, drag-out fight in the street with Evelyn Ross told the town all it needed to know about Tommy’s true affections. Now, all these years later, PJ needs to piece together the events surrounding Tommy’s disappearance. His investigation leads him to close quarters with both women—Brid a dissolute alcoholic and Evelyn a sheltered spinster—and triggers surprising, quite different forms of intimacy with each. But there are others in the town, including PJ’s own housekeeper, Mrs. Meany, who all seem to know more than they are saying. And then the police discover something quite surprising about the body. . . . 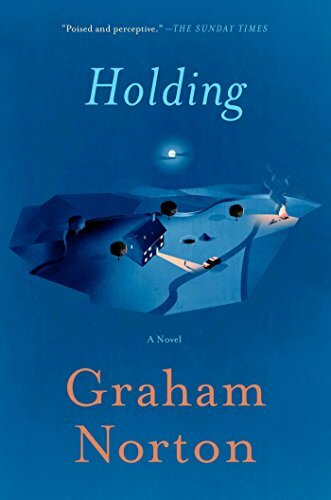 In Graham Norton’s debut novel, Holding, the author uses his typically sharp and piercing sense of humor to breathe life into a multitude of delightful characters. The author is an award-winning television talk show host and comedian in the U.K. and in 2016 published his bestselling memoir, The Life and Loves of a He Devil. He also writes a weekly advice column for The Telegraph. Set in the tiny village of Duneen, Ireland, which has “somehow managed to slip through the World Wide Web. No 4G, no 3G, no signal.” The plot of Holding revolves around three main characters: Sergeant PJ Collins, Evelyn Ross, and Brid Riordan. The mystery itself—the discovery of a skeleton found buried at the sight of a new housing project—is astonishingly not the central focus of the plot. Its main emphasis is how the discovery affects each of the main characters through love, secrets, and loss. Overall, Holding admirably captures the peculiarities of small town Ireland. Although the mystery plot is not the most riveting, it is certainly entertaining and succeeds in capturing a unique perspective on the peculiarities of life in rural Ireland. At times both distressing and tender, and yet darkly comedic, Graham Norton has created a charming debut novel that is well-worth reading.